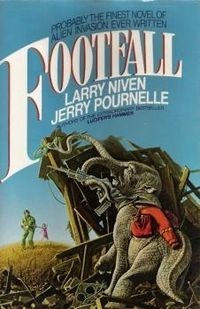 I picked FootFall by Larry Niven and Jerry Pournelle up at a used book store a couple of years ago. I’ve previously read a number of Niven / Pournelle books, including the science fiction classic Lucifer’s Hammer, and though I probably didn’t spend too much time examining the plot for Footfall, the idea looked interesting. Footfall was published in 1985, when the cold war was still frigid and Tom Clancy was just beginning to churn out the techno-thrillers and high concept plots that had the whole world teetering on the edge of destruction. I bring up Clancy’s name because a) he blurbs the book on the front cover of the edition I have, and b) because the approach to the plot (a half dozen separate plot lines that inevitably come together at the end), reminded my of Clancy’s Red Storm Rising, which wasn’t actually published until 1986. Red Storm Rising is one of my favorite Clancy books. But I digress. Footfall is science fiction, and really doesn’t have anything to do with Clancy. The enemies here are not Soviets or Columbians or terrorists. They’re aliens from the Alpha Centauri system, who have come to take over the Earth. They’re a tribal species who resemble miniature elephants, with two trunks with dexterous appendages at the end of said trunks that allow them to build and control things. As herd beasts, their idea of taking over the Earth implies that they should be able to get humans to submit and surrender, and once that surrender is complete, they expect the fight to be over. They theorize they should only have to prove their superiority once, over the strongest herd (the Americans) and then the whole world will capitulate and serve as members of the herd. Yes, if only that were so, the world would be a much safer place for us all. As a concept, the story is not bad. The execution left me frustrated at times as the number of coincidences required to keep the story moving surpassed the level of plausible about a third of the way through when a man on a motorcycle crossing the US from California to Kansas stumbles across a woman and her daughter that he knows very well (also from California) just before they are attacked by the landing invaders. Now I suppose there aren’t a lot of people in Kansas (and even fewer after the aliens invade), but I had to squint just a bit to get past that one, and it just went downhill from there. There were a few too many story lines going on, especially at the beginning, that seemed to have nothing to do with the outcome at the end. They almost seemed like leftover pieces of other books shunted in to make page count… which is odd since at 560 pages, it is a tad long to begin with. There are two aspects of the end of the book that really sealed it for me as a ‘meh’ book. (These are slight spoilers, so skip this paragraph if you plan on reading this book). One is a complete continuity issue / deus ex machina where despite all of the US being under the thumb of the aliens, the heroes are able to bring 4 space shuttles together in one place without them noticing – a clearly offensive move to anyone who, you know, might be trying to prevent a counterattack on their space ship. The second is at the end of the book. The book ends the very second the conflict ends. There is no wrap up, no, “who lives / who dies”, no reunions. Yes, those can be tacky and overdone, and the book was already long enough, but it felt like this ending was a plot device, saying “look, we’re famous writers, and once you’re famous, you can do this kind of crap too.” I wasn’t satisfied with the ending, and I had to go back and read it twice to see if I missed something. Overall, Footfall was a bit of a step below an okay book. It wasn’t as bad as many I have read, and perhaps I’ll give it kudos for a unique story. But the execution was lacking, and I think I continued to read it because it’s interesting to read a book that is 25 years old, and was written in such a different time here on Earth, and to remember back to when I saw that world on a daily basis. Interesting, but not great.